DesignMarch is upon us! That festival where swanky elites, fashionistas and hipsters come together wearing their wackiest outfits to enjoy light refreshments, free drinks and, of course: design. This year’s festival has a lot cool of events in store—the programme booklet is on the streets now, and it’s crammed with interesting talks, fascinating exhibitions, new product launches and innovative designs. In fact, even the opening night programme is enough to make your head spin—so we’ve decided to help you out with five must-see picks each day of the festival. So here it is: the cream of today’s DesignMarch crop. Final year students in product design at the Iceland Academy of the Arts collaborated with Reykjavík’s forestry department to investigate a raw material, the willow tree. They created new materials by breaking the willow tree down to micro-scale using only heat and water. 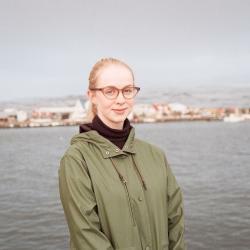 After the exhibition at the Maritime Museum, we recommend going to Hafnarhúsið to see ‘RE 7’, an exhibition where a group of different designers—including Kjartan Óskarsson and Design by Gróa—come together to exhibit their products. The opening of this exhibition marks the official opening of Design March, so it is the place to see and to be seen. And of course get free drinks. After the exhibit at Hafnarhús, take a trip to Kirsuberjatréð for the beautiful exhibition by Auður Inez Sellgren, Elsa Dagný Ásgeirsdóttir and Niki Jiao, who researched how weather has affected the living conditions of different communities. This Polish project focuses on the urban habitat of animals. The designers—consisting of Kosmos Project, Asia Piaścik and more—created nesting boxes and with that drew attention to the animals, insects and mammals in cities. This showroom is presented by The Icelandic Fashion Council and is sure to quench any fashionista’s thirst for textiles and colours. Designers including Magnea, Milla Snorrason, Anita Hirlekar and more exhibit their creations.